Can't login with any of my characters anymore after recent DT. Was working just fine right before DT. 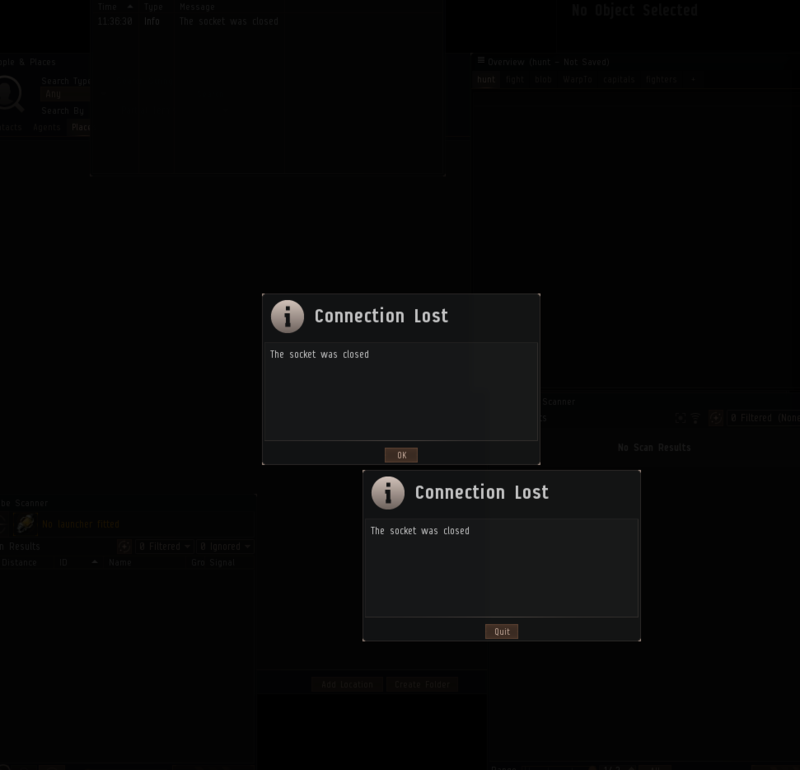 After selection of the character black screen freezes for a few seconds and results in double 'Connection Lost: The socket was closed' error messages. Tried both w- and known space. Same problem if I connect via ssh tunnel. If I don't use the tunnel, it works. Same issue here, provider is t-online . Same Problem here. I logged in before DT, came back after and I can't get in anymore. Resetting the router made no difference. Seems as it's working fine for me now. I was restarting systems and successfully logged in right after that - not sure if an issue was fixed while I Was rebooting or it was a reboot what fixed an issue. Several members of the corp are also not able to login. All Americans. getting to Toon selection, log in - pause - Socket was closed. got this a few times, shut down my programs, restarted the PC and was able to get into EVE. Same here. Character selection > "Socket closed"
Same problem here with 2 omega and 2 alpha accounts. Pc has been restarted several times and the modem/router has had a hard reset.